More than a week after Hurricane Michael flattened thousands of square miles, daily life is a series of fears and frustrations, both large and small, for thousands of people living on the edge. No power, no air conditioning, no schools, no information and little real improvement in sight. Missing relatives and worries that looters are just outside the door. Dirty clothes. Hours-long lines for gasoline, insurance adjusters, food and water. No power, no air conditioning, no schools, no information and little real improvement in sight. Daily life is a series of fears and frustrations, both large and small, for thousands of people living on the edge, more than a week after Hurricane Michael flattened thousands of square miles in the hurricane zone of the Florida Panhandle. Erin Maxwell waited in line for fuel for more than an hour Thursday at a gasoline station that never opened. “I’m tired and want to go to sleep. I don’t want to wait in another line,” said Maxwell, eyes closed and her head tilted back on the seat. Meanwhile, husband Mickey Calhoun fretted over the fate of his mother, Anita Newsome, 74. The retired sheriff’s deputy was last seen when officers took her to a hospital the day before Michael made landfall, her son said. “We can’t find her or get word anywhere,” said an exasperated Calhoun, 54, wearing stained khaki pants and a dingy towel draped around his neck. A few miles away, 70-year-old Ed Kirkpatrick and his 72-year-old wife, Sandra Sheffield, huddle together in a splintered mobile home surrounded by fallen pine trees. A noisy generator powers the old box fan blowing warm air across their den. They’re both afraid to leave because of widespread reports of looting. The man, a diabetic who has a big scar down the middle of his chest from heart surgery, needs medical attention and ice to refrigerate his insulin, said Sheffield, who has a pacemaker. But getting out in traffic takes hours and precious fuel, she said, and looters could show up at any time. “I don’t want to go anywhere because I know I’m safe here,” said Sheffield, burying her head in a twisted towel to cry. Michael slammed into Florida’s Panhandle with 155 mph winds on Oct. 10 and retained hurricane-force winds deep into southern Georgia, also affecting the Carolinas and Virginia. Florida authorities on Thursday say the storm killed 24 people in the state, bringing the overall death toll to at least 34. With power still out in much of the Panhandle and thousands of buildings destroyed or damaged by Michael, almost nothing is normal. Even simple tasks are difficult or impossible. Driving times are doubled or tripled because roads are clogged with police and fire vehicles, utility trucks, returning residents and people seeking help. Lines are long outside a discount store where more than two dozen insurance, financial services and cellphone companies have set up in a temporary village of open-sided tents erected on asphalt. Unseasonably warm temperatures in the 80s are adding to the misery because so few people can cool down with air conditioning. Bottled water is plentiful at roadside aid stations; ice is another matter. Spotty cellphone service leaves those most vulnerable with little information to help them get by. Residents in Panama City eagerly ask for information about what happened about 20 miles away in devastated Mexico Beach, and for tips on finding pharmacies, coin-operated laundries and stores that might sell batteries to power flashlights with fading beams. Kelli Ladik is living with four daughters and her husband in a camper parked outside their bayside home, which has severe water damage from rain that poured in when the roof failed. Ladik is so, so tired of the grime. “We need running water more than anything. To be able to shower after a full day of cleaning would be great,” said Ladik. Her kids, three of whom are school age, are all out of class and it’s unclear when classes might resume. Some school buildings are heavily damaged and leaders are still trying to account for all the teachers, administrators and others who are needed to get the system running again. 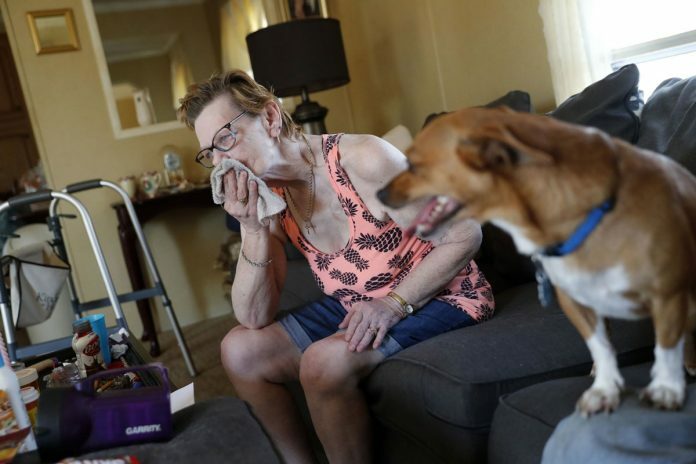 Watching friends and loved ones suffer is the hardest part for Nancy Bartice, who used to live near Ed Kirkpatrick and his wife. Feeling helpless to assist the couple, Bartice was trying to get to nearby Panama City Beach to get them gasoline and, perhaps, a better place to stay. Who knows how long the 16-mile journey could take.